The senate inquiry on the alleged extra-judicial killings (EJK) in the Philippines has resumed on September 15. 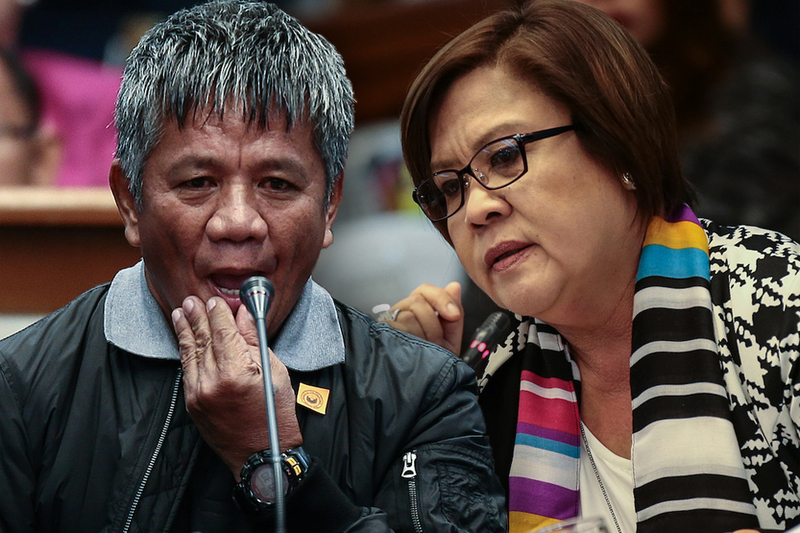 The probe, which was launched by Sen. Leila De Lima, aims to pin down President Rody Duterte for his alleged involvement in shadowy group Davao Death Squad (DDS). The main subject of the hearing was Edgar Matobato, a self-confessed hitman, claiming he was once a member of the DDS. The hearing was aired live on national TV and was a hot topic online. Many netizens aired their opinions about the revelations Matobato revealed, but many Dabawenyos also said these stories aren't unfamiliar as De Lima also trooped to Davao City in the past. It can be remembered that in 2009, De Lima launched an investigation to the alleged killings of the DDS when she was still the head of the Commission on Human Rights. That story was widely covered by local media in Davao especially because De Lima also broke laws just to get witnesses to testify against Duterte. The mood at the hearing was primarily intense, mainly because of the gravity of the accusations that Matobato revealed. We've seen Trillanes harass Senator Cayetano by intimidating him, even went far by shutting down Cayetano's mic and egging De Lima to declare Cayetano 'out of order'. Several Senators were also able to ask questions to the witness, but it was also during this time when inconsistencies in his statements were noticed. According to a Facebook post, there were 17 instances where Matobato provided inaccurate information or deliberately lied. Right after Matobato gave his testimony at the senate hearing, Representative Karlo Nograles immediately belied Matobato's claims. He said no one was killed during his Father's term and when he entered politics. He also added that the political differences between Duterte and his father "has always been strictly on the level of difference in policy and style" and never resulted to any physical confrontation or violence. "Wala akong close-in security na napatay when I was running for (Davao City) Mayor. I was House Speaker at that time. Nung Speaker ako, ang close-in security ko ay mga Marines, mga nasa active service." Former PSSCC Frank Villaroman belied his claims. 5. Richard King was killed in his office at the Vital C building and not at McDo. 6. There is no man named Matobato in CAFGU list as confirmed by the Philippine Army. 9. Initially said he was a ghost employee by Davao City Hall and receives 3K per month but later changed it to 5K. When egged by Sen. Lacson, he said he's been killing people with no compensation at all. 11. Mr. Matobato said in 2003 then CHR Delima had a police operation to dig alleged graves and was planned to be ambushed (killed) but the now Senator Delima immediately corrected that it was 2009, sino ba talaga ang witness? 16. He said "pinapark daw nila yung van na itim na ginagamit nila pang kidnapped sa GAISANO SUBDIVISION," but there is no such subdivision with that name in Davao, ano imagination lang? The items above originally appeared on a Facebook page Duterte2016. De Lima successfully evicted Cayetano from the hearing citing the latter's remarks against her. Cayetano talked to the press after leaving the senate hearing. Senator Panfilo Lacson likened Edgar Matobato, the self-confessed member of the so-called “Davao Death Squad,” to Angelo “Ador” Mawanay, the former whistleblower who tried to link him to crimes but eventually went back on his claims. As an expert investigator, Edgar Matobato is not a credible witness. 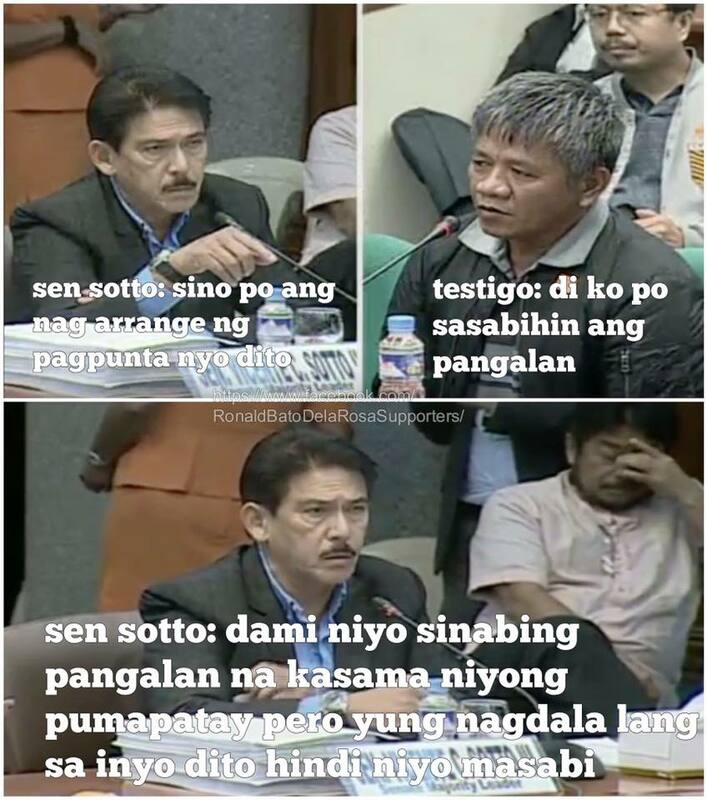 Meanwhile, Senator Tito Sotto also grilled Matobato for his inconsistencies.